April marks the births of father and son civil engineers Sir Marc Isambard Brunel and Isambard Kingdom Brunel. Marc Isambard Brunel is most famous for the construction of the Thames Tunnel. His son Isambard Kingdom Brunel is known for construction of a network of tunnels, bridges, and viaducts serving England’s Great Western Railway. Marc Isambard Brunel was born April 25, 1769, in Hacqueville, Normandy, France, the second son to Jean Charles Brunel and Marie Victoire Lefebvre. Marc became a naval cadet and was serving abroad when the French Revolution began in 1789. As a loyalist, he fled France in 1793 to the United States where he submitted a design for the new Capitol building to be built in Washington, DC. His design was admired but not selected. In 1796, he was appointed chief engineer of the City of New York, where he designed commercial, residential, marine, and military buildings. Three years later, he returned to Europe, sailing to England, where he married Sophia Kingdom, an Englishwoman whom he had met years earlier. In 1802, Marc made a proposal to the British Admiralty regarding his patented blockmaking machine as a replacement for the expensive handmaking of wooden pulley blocks for the Royal Navy’s fleet. 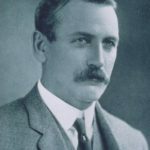 His proposal was accepted and the Portsmouth Dockyard Block Mills were built, producing blocks at 10 times the handmade production rate. 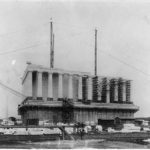 For 20 years, Brunel undertook many endeavors in machinery works, some successful and others unprofitable. It was during this time that Isambard Kingdom Brunel was born, April 9, 1806, in the Portsea parish of Portsmouth, Hampshire, England. The family moved to London in 1808. By 1821, when Isambard was 15, his father had accumulated debts due to poor financial management and was sent to debtor’s prison. While in prison, Marc began corresponding with the tsar of Russia, and considered moving to St. Petersburg. Fearful of losing a preeminent engineer, the government released him from prison with a condition that he abandon all plans to travel to Russia. In 1824, Marc Brunel was appointed engineer to the Thames Tunnel Company and work on the project began in 1825. Earlier, in 1818, he had patented his design for tunneling shield, which was inspired by the destructive wood boring mollusk Teredo navalis, a major cause of damage and destruction to submarine timber structures and the hulls of wooden boats. Brunel’s invention provided chambers for workers to dig at the face of the excavation while the shield was driven forward by jacks and the tunnel behind was lined with bricks. Completed in 1843, the Thames Tunnel is the first tunnel known to have been constructed successfully underneath a navigable river. Isambard Kingdom Brunel assisted his father in the early construction of the Thames Tunnel, but he is better known for his later work. He won a competition for the design of the Clifton Suspension Bridge in Bristol over the River Avon. Begun in 1831, it had the longest span of any bridge at the time of its construction, but never claimed that title, as multiple delays, including the Bristol Riots of 1831, caused frequent construction stoppages between 1831 and 1862. The bridge was eventually completed in 1864. In 1833, Isambard Kingdom Brunel was appointed chief engineer the Great Western Railway, for which he is most known. The Great Western Railway was a plan to link Bristol to London by rail. Brunel was responsible for choosing the route of the railway, and his design achievements included many iconic engineering works: Bristol Temple Meads Station, Paddington Station, Hanwell and Chippenham viaducts, Maidenhead Bridge, and the two-mile long tunnel through Box Hill. More than 150 years after its creation, the original main line has been described as one of the masterpieces of railway design. 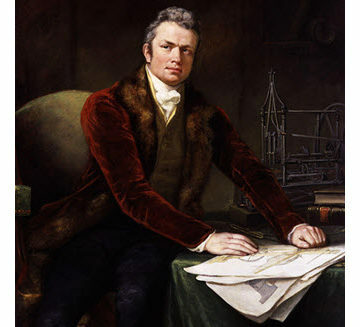 Marc Brunel died on Dec. 12, 1849. 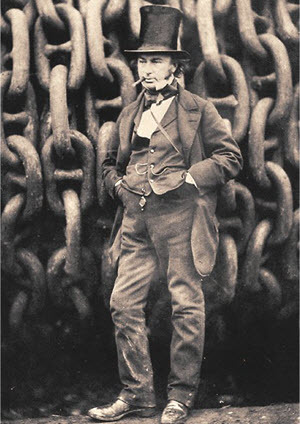 A decade later, Isambard Kingdom Brunel suffered a stroke and died Sept. 15, 1859, at the age of 53. 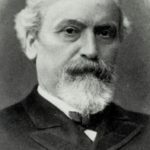 Both father and son are buried in Kensal Green Cemetery in London. It is valued history, I am finding the valuable sources I was looking for it quite time. I would to read further more of the civil engineering history.